My name is Shannon and I have a sweet tooth, or should I say had a sweet tooth! The “low sugar” or “sugar free” life never fully resonated with me until over a month ago, after researching about sugar and artificial sweeteners in chewing gum… and down the rabbit hole of internet searching I went, all about sugar and how crazy addicted many of us are without even realizing it (and how chewing gum contains sugar alcohols and chemicals/artificial sweeteners that can cause upset stomach/bloating… who knew! Gum is the last thing I would have linked to stomach issues). Not to mention, studies proving that sugar is the root cause of chronic illness from diabetes to migraines to cystic acne and obesity. It’s even been proven that sugar can feed cancer cells. I’m well aware of refined, processed sugar being an enormous problem in the U.S. as it lurks in most processed and/or packaged foods but because I eat a plant based diet and stay away from conventional candy, soda pop and white sugar, etc., I figured my sugar intake is mostly made up of natural sugars and not something of concern. There’s only so much we can take on and implement into our daily lives that is wellness related, ya know?! There are SO MANY trends. Mushrooms, CBD Oil, Lectins, Adaptogens, Celery Juice, Chlorophyll water (guilty), the list goes on. I’m enough of a wellness junkie as it is and this whole sugar debacle was the last big thing on my so-called “list” of trends to tackle/try. Plus, I have many restrictions already, being vegan and all, which works for me because I thoroughly enjoy the plant based life but sugar always felt like another “thing” that I didn’t want to go without. You’ll see how this changed for me as you read on! Hours passed, I learned a lot and somehow ended up ordering sugar-free syrups and keto chocolate bark from ChocZero on amazon. Before you get worried, these products are not filled with things like aspartame or sugar-free artificially made sweeteners. They are made with monk fruit and real ingredients. Also, I’m not keto or completely sugar-free (I savored a few vegan cookies yesterday with almond milk – oops!) but having an awareness of how much sugar I actually eat on a daily basis has been eye-opening, to say the least. Cane sugar in my almond milk creamer for my coffee every morning- about 20g on average for one cup… eek! That’s A LOT of sugar to start your day with. Ugh, what I was thinking. Pure maple syrup in my oats or chia pudding. My breakfasts vary (according to my hormonal cycle!) and don’t always contain sugar and even if they did, it was only 1 tablespoon or less of maple syrup but still, it can quickly add up. Vega protein snack bar or any vegan protein bar – I’ve since cut back on protein/snack bars because of the sugar content and now make my own homemade protein bars usually without the chocolate coating, or I’ll eat the 22 Days Nutrition protein bars that contain only 4 grams of sugar but man, sugar is so sneaky in store-bought bars and so difficult to get around. Sheesh! Some of the nut butters I used to buy would have added sugar, so now I only buy raw nut butter with one ingredient. Couple pieces of vegan chocolate after dinner (or basically whenever I wanted, lol) – the sugar in chocolate can add up quickly too, especially if you’re a chocolate lover. Not to mention any kind of sauce/dressing for my salads or glow bowls which contain minimal amounts but once again, it can add up. The occasional Surf Sweets natural candy gummies – I used to have intense cravings for these but not so much anymore, after establishing some new habits! That’s the kind of sweet tooth I was dealing with… not necessarily “bad” but not “good” either. Some days I would have intense sugar/sour cravings. Some days it was just chocolate. Some days it was fruit. Some nights it was ice cream! I should mention that I don’t really count the sugar in fruit but I’m aware of the amounts that I eat and try not to go overboard (except with watermelon – I LIVE for fresh watermelon). So how did I start? I gave up all sugar for 4 weeks. It was intense! The first reason I deemed this to be possible? I owe it to the sugar-free chocolate bark from Choc Zero that I mentioned earlier. This chocolate saved me during those dark times of intense cravings (it has a ton of fiber too). Otherwise, I would have said screw it, life is too short to not eat the damn chocolate. I know that’s what some of you may be thinking… can’t you just enjoy life and eat the chocolate?! YES! That’s what I was doing, and overdoing in a major way. While I love chocolate and sweets, I needed something to change. Ya know what I mean? I was so tired of being controlled by my cravings. I needed some new inspiration and motivation to tighten up for summer. I needed a new challenge. 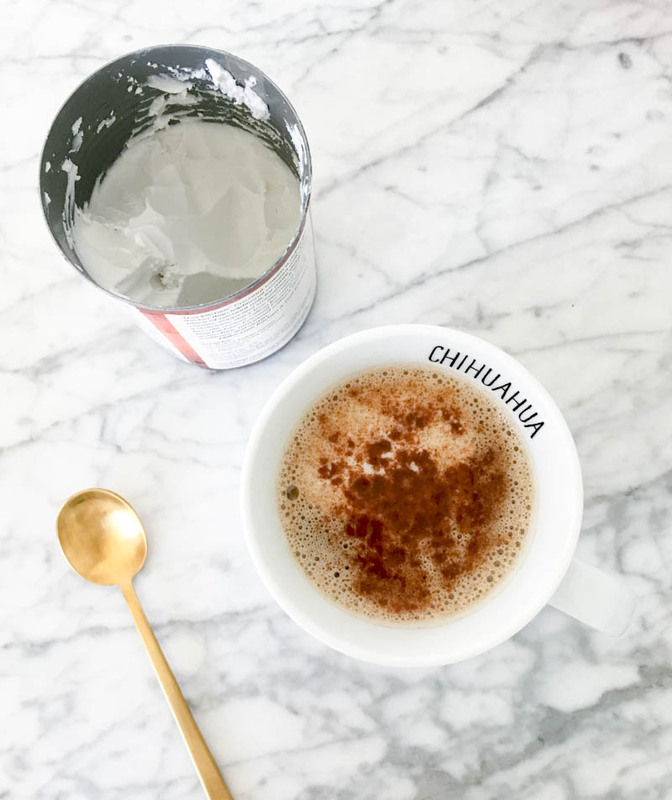 I changed up my coffee routine to one that is super creamy yet sugar-free and still so very satisfying. Recipe is shared below. Quitting sugar forced me to check every label before inhaling the food without thinking, LOL. I’m well-trained in reading labels but looking at the sugar content in everything was something extra. 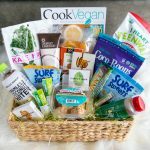 This challenge wasn’t hard per-say, but going completely sugar free eliminated some of my favorite snacks like boomchickapop kettle corn, most store-bought granola and all of my go-to protein bars I loved for quick fuel, as well as my store-bought salad dressings and obviously any and all sweets. Looking back, eliminating those processed foods was the best thing I could have done, for my health. I didn’t eat fruit the first week until I accidentally added 1/2 banana to a smoothie one morning during the second week out of habit, without even realizing it until after the fact. I also bought a mini watermelon the second week and devoured it without really caring about the sugar-free thing ha.. I’m not perfect. Fruit tastes really good when you haven’t had sugar in a while!! From then on, I allowed myself a small amount of fruit if I wanted it, which wasn’t everyday. I still believe fruit is fine because it’s a whole food filled with so much goodness like vitamins, minerals, fiber and antioxidants. Plus, I’m not that devoted to the sugar-free life to never eat fruit again, especially with summer coming up… that’s just cray in my opinion. While experiencing a craving, I read a book, made some herbal tea with stevia, went on a walk, ate a spoonful of raw almond butter, or ate half a bag of chocolate bark… oops! 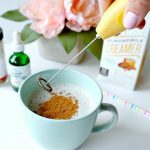 I experienced major headaches, intense sugar cravings and foggy thinking as well as earaches (which I later found out was candida dying off in my gut. Eeek!!!). But my skin looked great and still does. I’m not lying when I say those lingering hormonal breakouts on my jawline have disappeared… and haven’t returned since quitting sugar. For me, that is nothing short of a MIRACLE. I’ll take clear skin all day everyday over sugar. Also, I feel like the little wrinkles that I started to notice around my eyes have diminished. Any kind of inflammation and/or bloating has disappeared. Overall, it was more of an adjustment than it was hard. To this day, I’m SO GLAD I DECIDED TO DO THIS. I WOULD DO IT ALL OVER AGAIN. Where I stand with sugar today? I’m over it. I’m tired of sugar lurking in everything, causing children and adults to become addicted without realizing it. The only chocolate I will eat now is the chocolate bark. If Choc Zero ever goes out of business I’ll be in trouble, but pretty sure I’m keeping them in business, so I should be fine, LOL. If I can avoid sugar, I do. 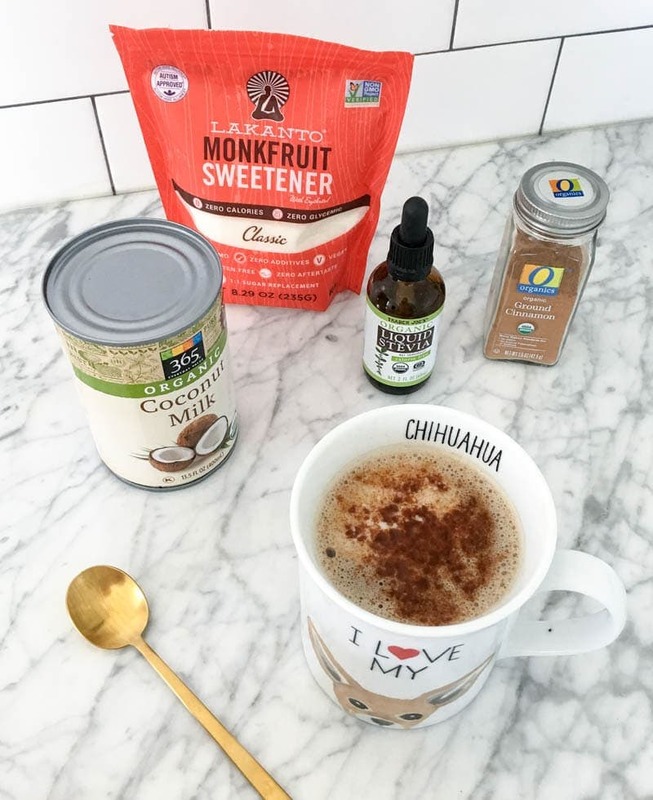 That being said, I may occasionally use coconut sugar in a recipe for the blog because not everyone is into monkfruit sweetener or stevia, etc. or has access to it, but eliminating sugar (for the most part) for those few weeks changed my whole perspective and I can’t imagine going back. I’m happy my sugar addiction no longer controls my cravings and the foods I reach for. If we’re being honest though, I still have the occasional sugar craving, so I reach for fresh fruit. If I’m traveling, I bring monkfruit drops or stevia drops for my coffee or for anything that needs to be sweetened. When I taste something sweet now, it’s overly sweet and way too much and not even worth it because I know that much sugar will give me a major headache later. Yikes that is quite a list… not even sure if that is all of them. Don’t be alarmed if this seems like a lot all at once, because it is! It took me a while to grasp this whole sugar free thing. We’re all different and how we respond to various sweeteners will be unique to everyone, but if you are sugar free curious, take a look at everything and every label you come in contact with and get familiar with how sugar lurches in literally everything!!! It’s insane. 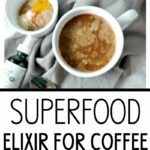 Okay, on to my NEW Elevated Coconut Coffee Recipe!! 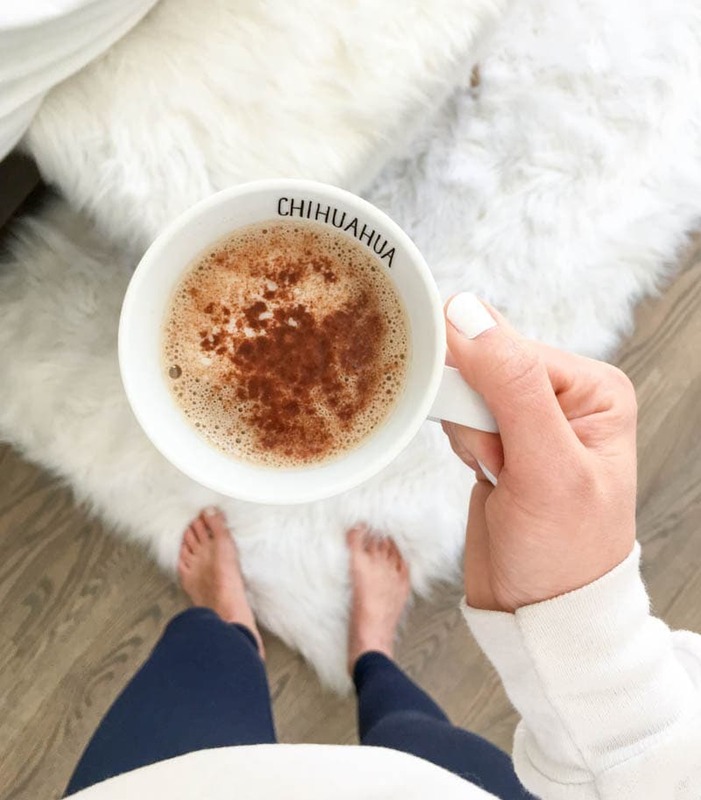 I feel like I talk about coffee all the time… too much maybe? You guys are probably SO sick of it. Especially if you don’t drink coffee. This isn’t just about coffee for me though, this is about feeling good from the morning on, preventing sugar crashes and trying new things. Switching things up from time to time is good! Brew one cup of coffee. Then add and stir in the following ingredients. (I prefer to use a milk frother to froth up the coconut cream!). Enjoy!! 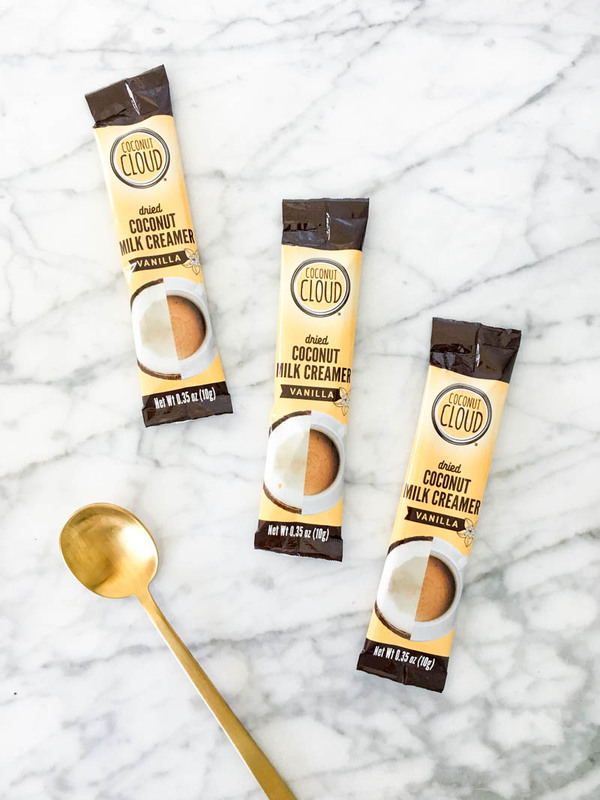 For travel, I love this Coconut Cloud Creamer below!! Not many places we travel to can accommodate a dairy-free lifestyle. Bring this monkfruit extract or stevia too, and you’re golden 🙂 no sugar packets filled with refined garbage! And finally, my beloved chocolate!! 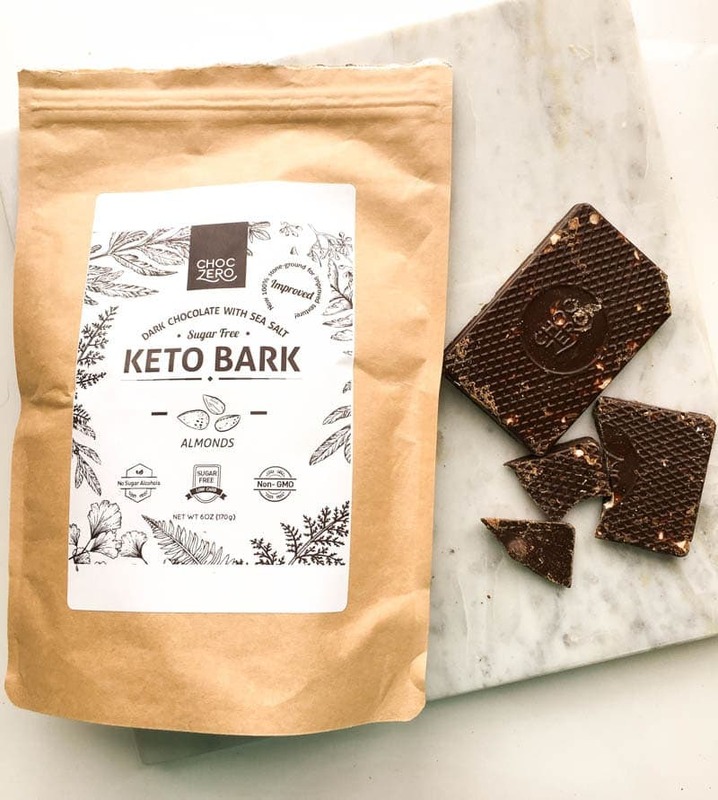 The Choc Zero Dark Chocolate Keto Bark… LIFE-CHANGING!! They have since changed the packaging, but the dark chocolate almond flavor is the BEST. I much prefer it to the coconut flavor. I can’t imagine going back to regular vegan chocolate now because of all the sugar… This product helped me fight through those crazy sugar cravings. Also, the Lily’s brand of chocolate is a great option, as it is sweetened with stevia only. So if you’re still reading lol, I’d LOVE to know where you stand with sugar? What are your favorite alternatives and do you use any of the products mentioned above?! Ok. I need to do this, and I think it will be fairly easy because I don’t have a sweet tooth. This blog post is SO helpful and eye opening, omg yes!! I do use pure maple syrup, stevia drops, coconut sugar, and coconut nectar when I follow some recipes. 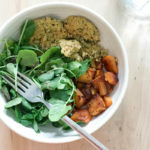 I love your pumpkin bread recipe, Detoxinista’s vegan almond butter freezer fudge recipe, and The Vegan 8’s pancake recipes. I eat Theo’s chocolate sometimes and Coconut Bliss, So Delicious, and Ben & Jerry’s non-dairy ice creams. So, giving up the ice creams will be hard, but it will also save me money! I’m excited to do this because honestly, vegan baking can get expensive when making high quality mostly healthy desserts. I love fruit even more. Pineapple is my favorite fruit. I just bought some pure maple syrup, I have a brand-new bottle of coconut nectar, and I still have some blackstrap molasses, so I will use them first before cutting them out. Have you ever tried coconut nectar? If so, what do you think about it? I do love using dates at times, too. I don’t drink coffee, but i do want to try the monk fruit sweetener. Thank you so much for this helpful blog post!! It’s so important! Have you seen the documentary called “Fed up”? I watched it on Netflix and it was a real eye opener for me on sugar and had a lot of really good information. Try Lily’s Chocolate… they have vegan, no sugar added flavors! Part of the proceeds go to a childhood cancer organization too. Game changer! Ooh what a great topic! 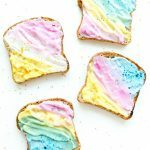 Sugar sensitivity was one of the first issues I tackled in my wellness journey (having been vegetarian for years anyway). I grew up eating a TON of sugar and processed foods and drank Coke at lease once a day but usually more. I read a really interesting book called “Potatoes Not Prozac” by Kathleen DesMaisons about sugar addiction and mental health. Blood sugar really does impact all of your systems! This book helped me take a step back and cut out a lot of offenders for me, and just taught me how to pay attention to how sugar makes me feel on a daily basis. Noticing how it makes you feel is such a key step. I kept a food journal like the book recommends and it was surprising. Now I eat substantially less sugar, and being a person with ‘sugar sensitivity,’ I notice that when I DO indulge in something super sweet like candy, it sets me up for cravings that can be hard to get over for DAYS. I do eat fruit as my main sweet; I drink a lot of smoothies with banana/cacao plus other things for a guilt-free treat that doesn’t wreck my blood sugar. Sometimes I have desserts but only the kind I make at home so I can control the quality and amount of sugar. I seriously get high if I eat conventional boxed-mix-brownies or similar desserts. I retrained my taste buds to enjoy the taste of coffee without sugar (just coffee and almond milk) and now if I sip my husband’s sugared coffee it’s so gross to me! As far as these products – I haven’t tried monkfruit but sometimes I use coconut sugar (with lower glycemic index.) I love my Garden of Life vanilla protein powder with stevia! I’m glad low-sugar is working for you! I’d be interested in seeing more recipes on your blog with low sugar, like granola bars or energy bites.